I thought I would seriously regret turning 21 in a foreign country, but it actually turned out to be one of the most fun birthdays I’ve had. Check out how memorable it was, even 6,500 miles from home. Since I last wrote, a great deal happened, not the least of which is that I turned 21! Yes, I was finally of the age where I could legally drink (even though since arriving in Hong Kong I had been able to drink anyway; the drinking age over here is 18), if only I actually enjoyed the taste of alcohol (keep in mind this was a few years ago – my palate for certain alcohol has been refined since then). But let me start at the beginning since my last update. Tuesday night, the Exchange Activities Committee, hosted our first function “West Meets East.” It was a night filled with a variety of Eastern workshops for exchange and local students to take part in together. Some of the things we had planned included calligraphy, kung fu, wing Chun (another form of martial arts), Chinese knot making, Chinese opera, and traditional Chinese dance. I was in the Chinese dance. I didn’t know I would be in the Chinese dance until four hours prior to the event, and then I received an innocent looking e-mail…Actually, though I had a great time. 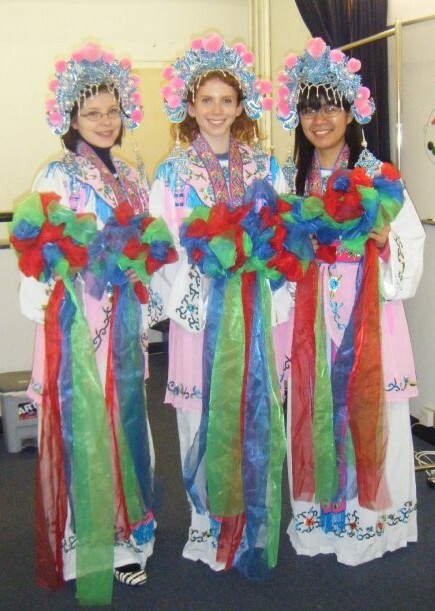 We all looked like total naturals for a Chinese opera performance, right? The dance we learned was quite simple, and the costumes we got to wear were gorgeous! If I could have kept mine for a future Halloween outfit, I totally would have. There were three students and we were only chambermaids according to the Chinese opera costumes, but the costumes seemed so elaborate anyway I certainly didn’t care! It went really well, and everyone got a huge kick out of it; overall the night was a great success. People had fun attempting to make knots, testing out their own dance skills, being amazed by the skill of the martial artists and trying their hands at the ancient art of calligraphy. Afterwards, Jen, also on the committee, and I both breathed a huge sigh of relief; we were amazed the event came together in the end and went over so well, we had almost no time to prepare for it beforehand. Thursday was D-day (or B-Day, whichever you prefer)! To start, I must tell you that my mom and dad (probably the two best parents in the world, but I’m a little biased) sent me a “birthday box” which I received a few days before my actual birthday with instructions to open the box as soon as I woke up the day of. I got up, opened the box (I was the only exchange student so far to receive ANY packages from home, by the way) and found, not just a “Birthday Girl” button, but also a “Birthday Girl” pink, feathered tiara complete with flashing lights. Truth. Needless to say, I wore that tiara proudly all day (and out that night) with my lights flashing. I felt like a rock star, and the funny looks I got from people just made me grin wider. A shot of our excellent Korean BBQ dinner at Han Wo. Delicious! 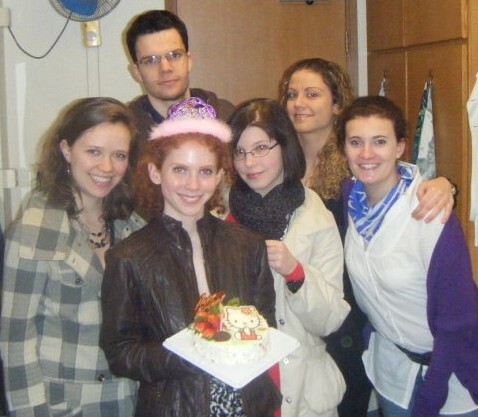 That night, my five closest friends surprised me with a birthday cake (so sweet of them!) 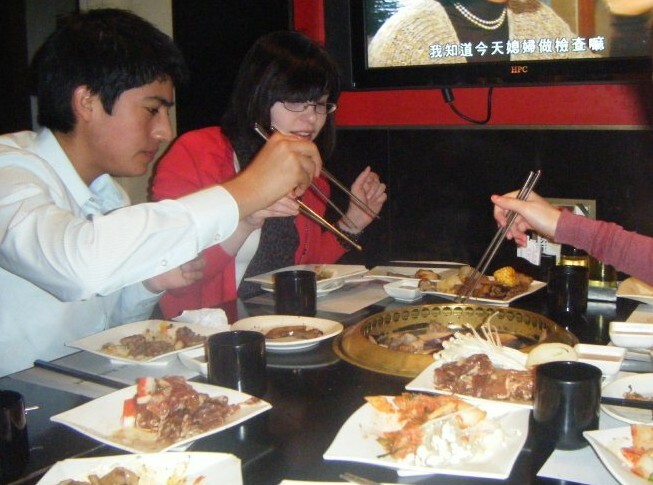 and then thirteen of us went to a Korean barbecue restaurant in Central called Han Wo. The deal was that you paid a flat rate and were challenged to come away hungry (i.e. : eat as much as possible), and we got to cook it ourselves at our table over gas grills set in the table’s surface! It was something I hadn’t done before, and I have honestly never eaten so much food in one sitting. There were so many different meats, vegetables, wontons, rice dishes, fruits, sushi, desserts AND ice cream! We all stuffed ourselves to get our money’s worth – obviously. And we rolled out of the restaurant hours later in veritable food comas. But no time to rest then! Because it was my birthday and Thursday night to boot, I was hell-bent on going clubbing in LKF, the bar hot spot of Hong Kong. I can now tell you, that I had the most alcohol I had ever had in my entire life up to that point (honestly, alcohol – or rather what was presented to me in college, really wasn’t all that appealing) – and it consisted of half a bottle of Smirnoff Ice. That was it. All I wanted, all I had. You may not believe me (and it’s fine if you don’t), but I had never had a full drink in my life up to that point. I didn’t really care for the taste of alcohol; I went out for the dancing, and we did a whole lot of that! It was so much fun; my friends, good music (the majority of which was American, by the way), packed clubs – it made for a very memorable birthday. And the Friday afterward, I was still so full from dinner that I didn’t need breakfast or lunch. Friday night was another story, though. Somehow my friend Richard had been roped into performing at a dinner for all the students in the science major at HKUST. He was going to attempt (and I stress this word) to sing Cantonese pop songs while people in the crowd had to try to guess the song. I’ll tell you now, Richard is from New York, is a white guy, and did not speak a word of Cantonese or Mandarin. Along with that, he had pulled some other students into this performance (no sense making a fool of yourself alone), and the four of them were going to sing English songs a capella for the crowd after Rich’s solo performance. So he tried to sing C-pop songs, and for half of them, his pronunciation was so bad that none of the students had the slightest clue as to what he was trying to sing, until the MC would reveal the song. The crowd, however, found this particularly funny once they learned what song he’d butchered. The second half when the four boys performed was hilarious, too. They sang Britney Spears, the Backstreet Boys, forgot the words halfway through, and continued giving it their all; hand motions, going into the crowd, clapping their hands over their heads, etc. They really hammed it up. It was epic to behold and hysterically funny; I enjoyed it immensely. And that’s that for my birthday and my first EAC event. Pretty much perfect, if I do say so myself. If you like barbecue, wait for the next post – it’s got more barbecue, Asian beat boxers and rocket ships! Stay tuned! A surprise Hello Kitty birthday cake from my roommate and friends. What more could a girl ask for? 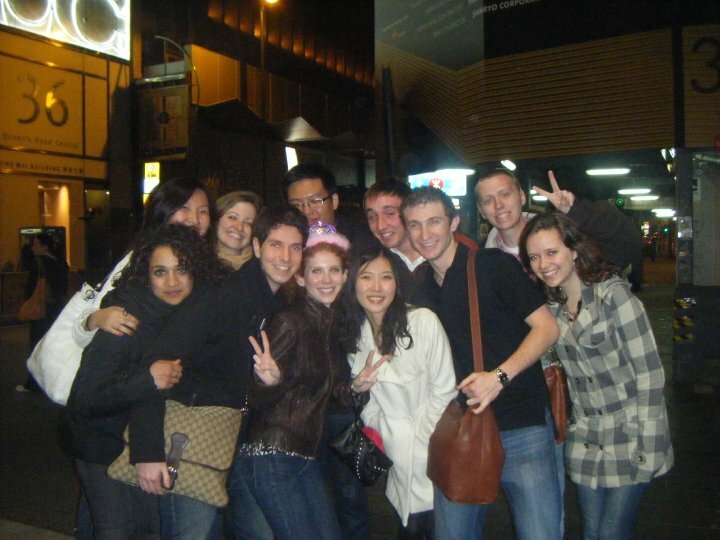 This entry was posted in Asia, Hong Kong and tagged Asia, barbecue, Birthday, Chinese Opera, Hong Kong, LKF, Travels on March 15, 2014 by Paige N..